CHRIS LINDAHL Feasthampton member Layla Hazen talks about propoer seed-saving techniques at the seed library at the Emily Williston Memorial Library in Easthampton. The seed library is being launched by Feasthampton as a way to promote food security and organic gardening locally. 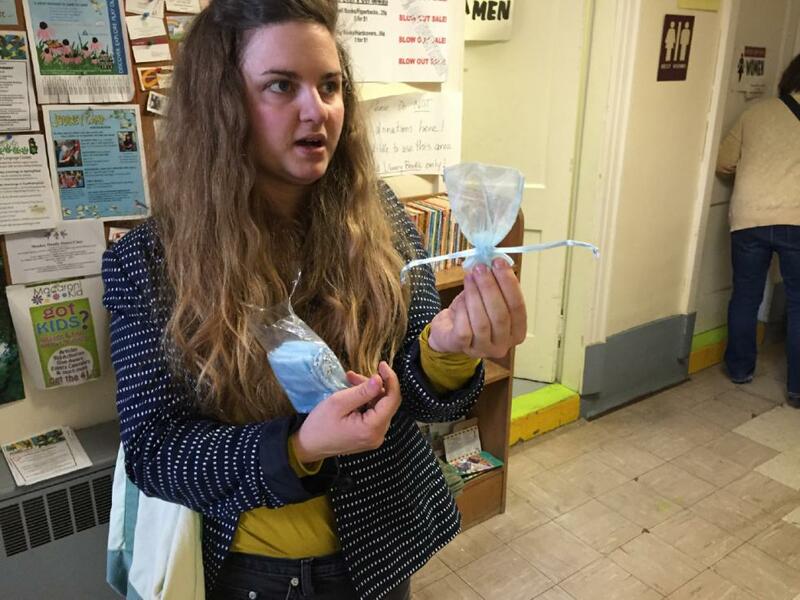 CHRIS LINDAHL Feasthampton member Corrin Meise-Munns demonstrates how to prevent a flower from being pollinated involuntarily using a mesh bag at the seed library at the Emily Williston Memorial Library in Easthampton. The seed library is being launched by Feasthampton as a way to promote food security and organic gardening locally. EASTHAMPTON — Though words like “local,” “organic,” and “open-pollinated” are often found on high-priced food labels, members of a food advocacy group called Feasthampton say quality, garden-grown food shouldn’t be a luxury item. That’s why they’re starting the city’s first-ever seed library at the Emily Williston Memorial Library in Easthampton. The project, which will host a launch event Monday, May 11, from 6 to 8 p.m., is designed to encourage organic gardening, promote local food security and decrease dependency on food sourced by large corporations. “We’re trying to take that out of the monetary economy and bring it into the giving and sharing economy,” Feasthampton member Corrin Meise-Munns said. Much like a book library, locals looking to test out their green thumbs can “check out” seeds free of charge — with just one catch. At the end of the season, they have to bring back seeds from their harvest so others can plant them the following year. “The only way the library will continue to work is if they return seeds at the end of the season,” Meise-Munns said. For the inaugural season, the library has been stocked with over 115 varieties of herbs, flowers and vegetables. “Libraries are such an important community space, so it sort of makes sense to have here,” she said. Anyone is free to check out seeds after an orientation kick-off Monday. Gabby Hollander of the Northampton seed company Backyard Seeds will deliver a talk during the event. At the orientation, Feasthampton members will discuss the ins and outs of seed saving — a vital step in the seed library experience. If you don’t save a seed correctly, Meise-Munns said, it won’t germinate. One of the simplest seeds to save are those from a sunflower: you simply let the seeds dry out from the flower. Others need more precise timing, requiring gardeners to let fruit rot in order for the seeds to be viable, according to Meise-Munns. She said it’s also important to ensure the plants are organic and open-pollinated. Organic means the plants were raised without conventional pesticides or fertilizers made with synthetic ingredients. Open-pollinated means the plants were not pollinated by a trademarked strain (such as Monsanto soybeans) or crossed with another variety. That means no hybrids, such as Sun Gold cherry tomatoes, Meise-Munns said. She would know. She said she recently embarked on a similar project with school-aged children through her work as an agricultural educator, with great success. 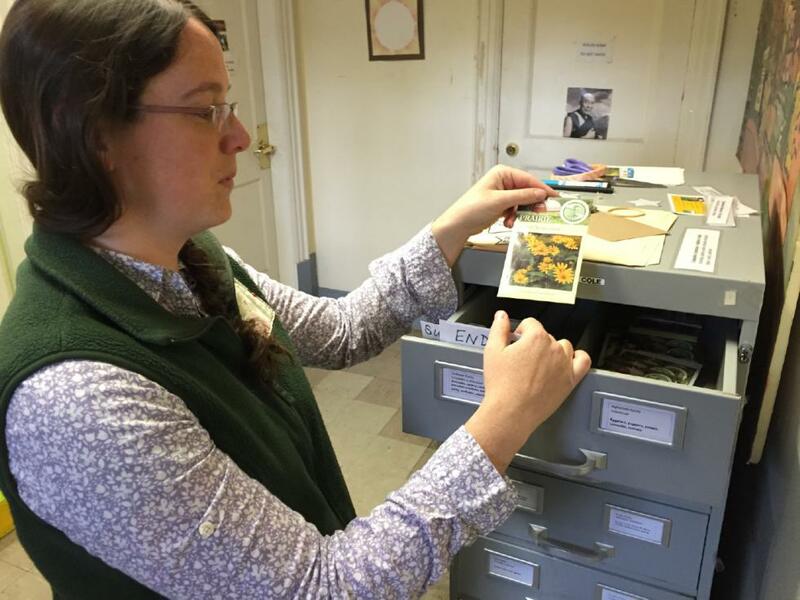 “Everybody is a seed librarian,” she said. 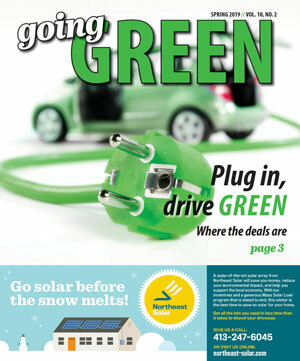 Chris Lindahl can be reached at clindahl@gazettenet.com.